The Amazing Power of Getting OUT of the Stirups! I've always prided myself in knowing that I have textbook deliveries. Even though I have gone through three inductions due to blood pressure issues, they have all been relative easy and I never needed any pain medication. Well with my first I had a little bit and begged for the epidural, but they came too slowly to get it started before I pushed baby out. With the birth of our most recent child last Friday May 18th, I knew this one was going to be different. I have been having fear and anxiety for quite some time (many weeks) and I just could not put my finger on where this fear was coming from. I had been having Braxton Hicks contractions for months. 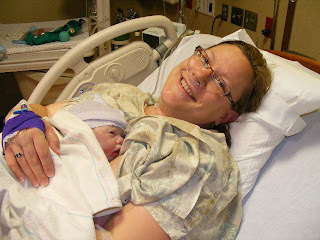 At first they were "normal" in that they felt like normal BH contractions that I had with my other pregnancies. 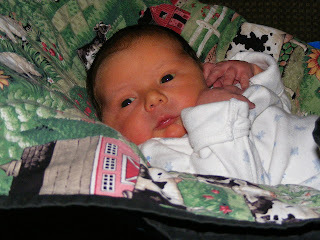 As I got closer and much bigger to my due date, they began feeling different. Instead of lots of pressure in my belly and the feeling of baby being pushed down, I would have lots of pressure in my pelvis with pain in my hips. I think it was the pain in my hips that made me start to question the position of the baby. 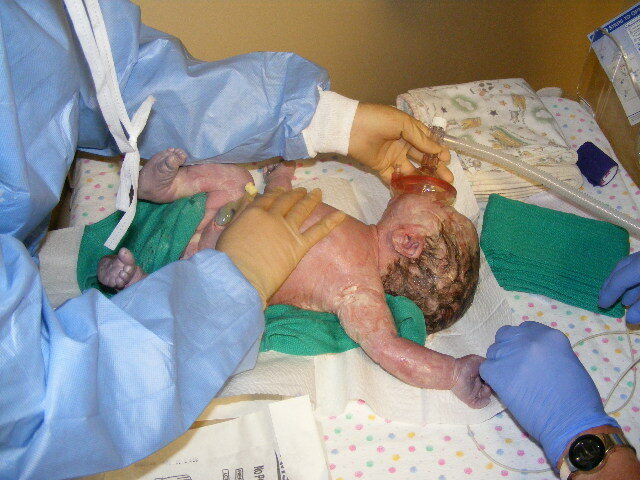 My biggest fear (which I think I wrote about before) was baby being breech and having to have a c-section. The day before I delivered, I had my 37 week appointment. During the previous week I was checked for dilation so Dr. V did not check me again. However he did feel around my belly to see if baby was sitting head down. It was totally not very comfortable, but it was bearable and he really didn't seem 100% positive that baby was head down. That afternoon I had contractions non stop into the evening. I didn't think twice about them because I knew that when I went to bed that night they were going to stop, which they did. I sent a text message to my friend Sharon and she and I agreed that it sounded like pre-labor. While I was excited about that possibility, I knew it was a bit early as I was only 37 weeks. The next morning (Friday) I woke up from a great night sleep and through out most of the day I was still contracting, but nothing to make me say, "Yup, this is labor." One thing that did concern me was that when I had gone to the bathroom, it seemed like I had a very slight leak of my amniotic fluid. I know what it is like to have SROM (spontaneous rupture of membranes) and this did not feel like that. Through out the day it was hard to tell what it really was because I had already been having lots of mucus and pieces of my plug coming out all week. So I told myself that if anything changes by the evening, I would give the hospital a call and see what they suggest. In the mid afternoon, I decided to take a nap. A nap is not something I normally do (who does with 5 kids running around?). I had snoozed on the rocking chair, but I had gotten up to go to the bathroom and decided I needed to get a better rest than that. As I laid down, I realized that for the first time I was still contracting. This was kind of exciting, but at the same time I didn't put much stock in it. Around 5:30 pm, I went to the bathroom and had some bloody show. (Again another first for me on that one.) So I called the hospital and because of my questioning that my water may be leaking, they told me to come in. Now, keep in mind at this point, I have all my stuff ready to be packed, but nothing in a bag yet. After all I still have a couple more weeks to go. So I get myself ready to go and I head in alone with nothing but my cell phone. I get in and I am greeted by the PA. I tell her the story and they hook me up to the fetal monitor, take some blood, and put in the IV "just in case". From here events start to happen quickly. The first thing they (the PA and LD nurse) is check my cervix and do a test for fluid. The PA checked first and I could see something was up because I could see it in her face that she wasn't sure what she was feeling. When the LD nurse checked me she said I was 5 cm dilated with bulging waters. Well that would explain the wetness feeling I was having and the steady contractions. The thing they were unsure of was baby's presentation. So they call in Dr. V and they bring in the ultrasound. It was 6pm when Dr V came in and when he checked me he confirmed that I was 5 cm 100% effaced and baby was high. He was able to confirm that baby was head down via ultrasound. The decision was made, I was staying in the hospital and was going to have this baby. Oh my stars, I was totally not prepared for that. I then began calling in the troops. My husband was home and in the middle of cooking an amazing supper (orange chicken with stir fried veggies and noodles) and I tried to reach my mother. I couldn't get a hold of her, so I called my dad who was at the other farm working, so he said he would be at the house and would find mom. My dad, bless his heart. While my husband worked hard getting the food finished, my dad found my suitcase and packed up my things for me. Okay, so all the while I was making my calls my contractions were steady and regular, but not very painful though they seemed pretty impressive to the nurse on the monitor strip. Again I've always prided myself in being able to handle the pains of labor well on my own and the hospital staff all know this too. At 6:26pm Dr. V came in again to check me. Apparently at his last check, he was really not sure what he was feeling. There seemed to be something other than a smooth head presenting. They thought maybe it was baby's face with nose presenting first, or maybe it was a hand. As he was trying to find out, my water broke, with an amazing huge gush. Again another first there! My immediate response to the doctor, "Look what you did." HA! Oh yeah, definitely no going back now. 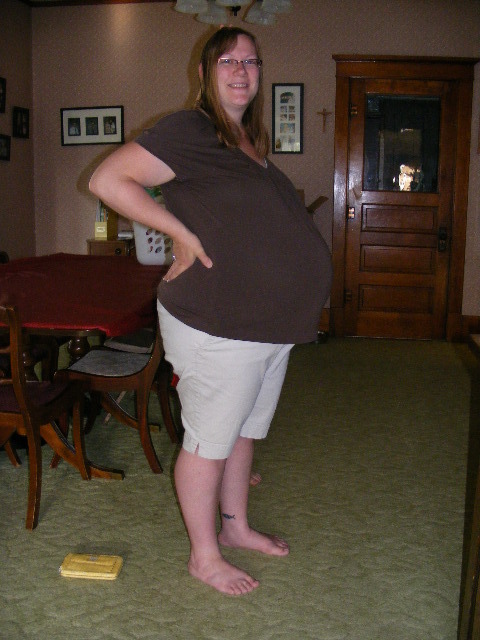 Okay, so it is no wonder I look so absolutely huge in my 37 week picture with baby sitting so high. I had a lot of fluid for him to hang out in. Thankfully the fluid was clear and we are good to go for another successful natural delivery. They were now prepared for a quick delivery. Not sure who, but Dr. V or the LD nurse expected arrival in about 30 min, but I said, nah 2 hours. From here time begins to get a little sketchy for me. Shortly after my water breaks, my husband arrives. My contractions begin to intensify, though I was able to relax and regroup between them. This was a consistent event all the way through until I pushed. Which is something I was so very grateful for later on. So, I'm going to say maybe an hour after my water breaking, they wanted to check me again to see how baby was presenting. 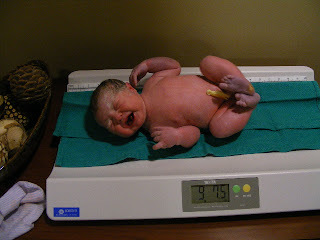 I was now at 7/8 cm with a little bit of lip of cervix to thin out and something other than baby's smooth head was presenting. Can I just say when you are in the midst of contractions and everyone is up in your business, it feakin' hurts. I'm not a very nice person when I'm in labor, and I was not too shy to tell them to get out of me. However, it was when the LD nurse checked me that they learned what was coming out. His hand. The little bugger had his hand over his head. The beautiful part of the vaginal check was that the little man held her finger. What gave me hope for a successful delivery was that the LD nurse said that there is plenty of room for him to come out vaginally. Okay, so to explain my contractions. They were unlike anything I have ever experienced. I would have the normal intense pressure in my belly, but my hips would be on fire. We had to try to get baby to turn and pull his hand in. Well, not that pulling his hand in is an absolute requirement (as we later learn), but it does make labor easier. Now no one said this, but I always thought that baby was also sitting at a bit of an angle so that his shoulders were getting a little hung up on my pelvic bones. So Dr. V and the nurse wanted me to change position to the knee/chest. With my husband by my side, I told him I knew that this labor was going to be different. I knew it in my gut; this is where my fear was coming from weeks ago. So I turned around in the bed and with my chest to the bed on a pillow and my rear in the air, we attempted to get baby to slide back up a bit to pull his hand down. Even in this position my contractions never changed. They were still the same feeling of fire in my hips with baby trying to push through (though I never felt pushy). I sat this way for about 10-15 min. What was nice and comforting was my husband gently rubbing my lower back/hips. I could not handle an actual back rub or any counter pressure, but light touch was definitely very soothing. The nurse then asked me if I wanted to move to my left side which I quickly replied, "No" and it gave her a good laugh. So I sucked it up and laid on my left side. Yeah, you want to cause a laboring woman more pain? Make her endure a couple contractions on her side. So again they decide to check me to see if changing positions helped and unfortunately it did not. So we got out of bed and I leaned over the edge of the bed. The nurse decided to try to use this position to see if she could get baby to pull his hand back. Her idea was to try to push his hand back with her fingers. Yeah, okay, next time (if there is a next time) I will not let this happen. That was torture. Oh, and another first for me was the fact that I kept peeing myself! What is up with that!?! I would have a contraction and I knew in order for it to help I needed to relax so that baby can move down, but in the mean time I'd relax and couldn't stop from peeing. This is where nurses rock. They totally deal with any mess that happens. So after leaning on the bed with no success to get baby to move, I stood up and went through one contraction standing up with my husband supporting me. This is where I should have stayed. I regret not listening to my husband who was trying to tell the staff that I need to stay out of bed and let gravity happen. My mind was in such a whirl wind from dealing with the intense contractions, that I could not speak up for myself. I got back into bed and with a final check, Dr. V said I was complete and ready to push. Oh the magical words to a woman. Unfortunately his words did not match my body at all. In fact it seemed to be so totally counter productive because I was now in the most awful position of legs in stirrups and baby pressing against my hips with each contraction. I tried to push through a couple contractions (and in the mean time shushing anyone who tried counting or tried to talk). It was just not happening. I told them I did not have the urge to push. I was confused. I hurt, baby did not feel like he was in the right position yet to be pushed out, and I was losing hope. As each contraction would come down, I would say, "My freakin' hips are on fire man!" I had to stay focused. I trusted my body, I trusted birth, and I trusted that God was going to help me deliver a healthy baby. 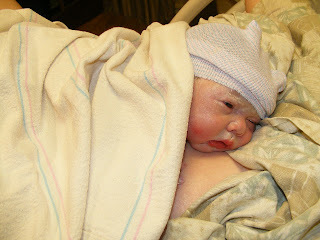 I'm a birth blog junkie. I have read so many stories of difficult deliveries. I knew that with support I could deliver this child, but my confidence was waning. After trying to push through a couple contractions, the nurse and Dr. V left the room to discuss what should happen next (I assume). The PA stayed with me as did my husband. I endured a couple more contractions on that awful bed in the stirrups and I had to find my inner focus. I would alternate between, "Jesus give me strength" and "I can do this" with each contraction. I am so very very grateful for the breaks between contractions to reach down to that inner focus. All the while I could hear my husband praying over me. I tried to focus on a prayer like the Lord's prayer or a Hail Mary, but that required too much brain power. Keeping simple with "I can do this" and "Jesus give me strength" was just enough to keep me going. My husband had to use the bathroom (he had been asking me for a while and I just couldn't let him go) so I told him to make it quick. Mean while Dr. V and the nurse came back in and he said he was calling Dr. A the OB surgeon to do a c-section. Dr. V felt like baby was stuck and I could not bring him down. I resigned very quickly and responded with a tired and pathetic, "okay" which my husband heard and was not happy about. This is where I should have listened to him to stay out of the bed. Dr. V said that it would take about 30 min to call everyone in and that I needed to endure the contractions without pushing (HA! yeah, screw that!!). 30 min. I died inside. Mean while, the LD nurse "prepped" me with a catheter for the surgery (yeah put that on my list of do not do's). Contractions continued to come and I begged for the medication to stop the contractions, but they denied me that (and rightly so). One thing that helped keep me going was knowing that the nurse said I have plenty of room for baby to come out. But I was losing hope quickly because I was getting tired, I hurt, and seemed to be stuck in a rut. Baby just didn't seem to be moving with any of the contractions. While we waited for everyone to come in, Dr. V left to get the surgery room set up. Meanwhile my legs were going numb from being in the stirrups (yeah, they left me in that position) and as each contraction came I ignored the "don't push" request and gave light pushes to make it through the contraction. I thought maybe if I gently pushed it would encourage baby to move into position. Finally I asked someone (didn't really know who was in the room at the time because I labor with my eyes closed) to put my legs down. The bed was all taken apart, so the PA put it back together and she and my husband got my legs down. Wow did that feel amazing; and it was the magical move too. I had a huge contraction come and that most wonderful and overpowering feeling to push happened. I could not deny it. There was no way in hell I was going to have that c-section. I was lying slightly at an angle on my left side so when it hit, I grabbed my right leg, pulled it back and roared with all my might. There is no way to even duplicate that sound. I screamed with a loud "AHHH" and I pushed with all my might. My husband yelled, "I see crowing!!" and the PA yelled for Dr. V to come (the nurse laughed later because she had never heard the PA raise her voice yet. She is a very soft spoken woman.) I'm not sure if the contraction even let up or I just did what I had to do, but I stopped making noise, continued to push took another breath and yelled again. With one long continuous push and the PA helping support and stretch my perineum, I delivered my son. He came out presenting with his left hand and forearm over his head. From what I remember, there was excitement and my husband said, "You did it!!". As soon as he came out, I looked at him and told them to give him to me. However since he was early at 37 weeks they wanted to give him some oxygen because he was not perking up like he should. I was being a bit pushy about getting him right away, but the staff was patient and told me that I would get him. Once I did push him out, I looked at my husband and he looked like he had just been through the whole ordeal himself. His face was all flush and sweaty. That man was truly empathizing with me. Later on he told me that it was very hard on him because there was nothing he could do for me. He wanted to help me, but he couldn't; he did not like seeing me deal with the pain. I love that man. The PA and nurse took the baby to the warmer and checked him out. He was having some difficulties breathing so they gave him some oxygen and he pinked up. They finally placed him on my chest and I was in heaven. It was done. I delivered my son. He was in my arms without a single cut being made on my body. He had some labored breathing while on my chest so we turned him on his side and I held the oxygen in front of him and it helped clear his breathing. The greatest part was there was no tearing! I thought for sure that with my forceful pushing I would have to have a couple stitches, but I was wrong. The LD nurse said I need to start teaching the labor class at the hospital because I do so well birthing my children. HA! You can see the bruising on his left arm. Our third son, sixth child Gabriel Thomas was born at 8:16pm on May 18, 2012. He weighed in at 9lbs 7.5 oz and was 20 inches long. Not bad for 37 weeks huh? And I was right; 2 hours after my water broke, my son was born. Looking back, was it a perfect labor and delivery? No not really, though in the end I still had a healthy baby. Could things have been done differently? Yes, many things could have been done differently. I am not angry that Dr. V was quick to make a decision for a c-section because it is a small town hospital. Anesthesia and the surgical team are not in house every day. So there has to be some leaning towards caution and preparation for an "emergency". On the flip side, that waiting period gave my body the time it needed to do what it was supposed to. Gabriel Thomas 4 days old. Allison, the PA who stayed by my side. 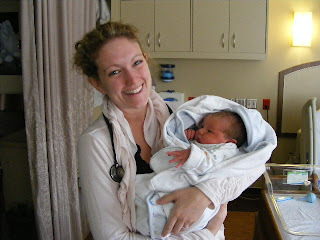 Dr. V. He brought me through a healthy pregnancy and a successful delivery. oh my. that made we tear up. that is amazing! i am so glad they let her get comfortable and then BANG! a beautiful baby boy! woohoo!!!! I totally cried when I got to the pushing part! You rock, mama!! Amazing! Way to go mama!! Hopefully the nurses, PA, and doctor learned something from that experience, and will be encouraging women to get out of the stirrups... at least in situations where pushing in them isn't going anywhere. Thank you for posting my story. It really was the most empowering experience ever. Even with my 6th child I still learn more about my own body. My husband has always been a wonderful support and I know he will speak up for me in the future. I do hope the staff will remember this and keep it in mind what is possible for a woman. So happy that you listened to your body and getting your legs out of the stirrups proved to be so helpful! 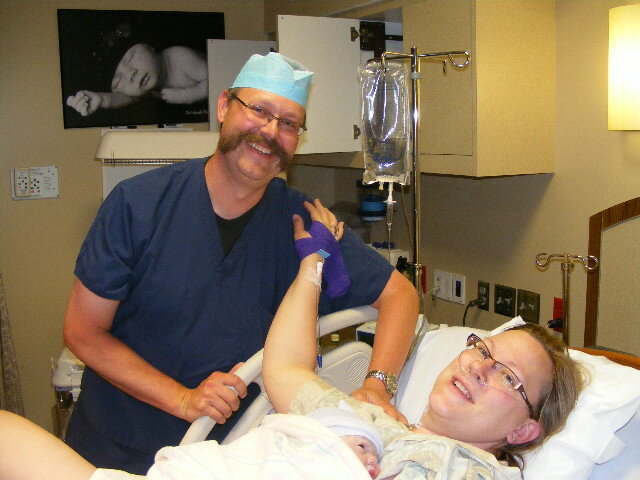 Both of by VBAC babies had their hand on their head for both the labor and the delivery. I know what you mean when you say hips on fire!! Yowzer!!! And if anyone is interested, I blogged about my whole journey towards a hospital birth. You can find it at www.clothconvert.com and just click on Our Blog. I'm so glad I chronicled the whole journey. This whole experience (labor) has really had a big impact on me. I'm finding that I think about it, replay it, and re-read my story many times. I stumbled upon this blog by accident..me too, my 2nd son had his hand on his head, it took a bit longer than number 1 and was a lot more work. I had a fantastic homebirth with a lovely midwife, she had me standing up using gravity and holding onto my husband for most of the procedure. I didn't actually realise having a hand up there was such a big deal 'til I read your blog!It amazes me how well you remember what was going on, things are very blurry for me. well done! What a great story, and how wonderful that your medical team was so supportive. Thank you so much for sharing it. Great job for following your instincts in the moment! My midwife had me deliver on my side (after moving from the tub to squatting and standing) to minimize tearing, and the recovery time was nothin' because of it.